Recent articles in magazines like TIME and Rolling Stone are calling attention to a new risk in the fight against heroin and opioid abuse: carfentanil, an opioid similar to fentanyl that is becoming more popular with people who struggle with opioid abuse. Carfentanil is a much more potent drug than heroin and opioid prescription medications. Stronger than morphine, and even more than fentanyl itself, this drug can quickly be fatal to humans, creating overdose with only very small amounts. This creates a very high overdose risk that can occur with use of this drug alone, and also for unsuspecting people who use heroin that has been laced with carfentanil. According to the National Library of Medicine’s Open Chemistry Database, carfentanil is a drug very similar to another highly potent opioid, fentanyl, which also has high overdose risk. In fact, carfentanil is described as being 10,000 times more powerful than morphine, and 100 times more powerful than fentanyl itself. Developed in 1974, the drug is not intended for human use, even medically. It is used primarily as a large-animal anesthetic, such as for elephants. As described by the Drug Enforcement Agency, this drug is dangerous to humans in extremely small amounts. Even a single grain of the powder can potentially be deadly. However, the drug is being disguised as or included in heroin by some dealers, while other people are specifically trying carfentanil, based on the potential for feeling a high even more intense than that experienced by using fentanyl. As with other opioids, carfentanil can affect the brain and body in ways that swiftly develop tolerance to the drug, creating physical and mental dependence. Still, the high potency means that the individual may not be able to become addicted to this drug specifically before it causes severe physical and emotional damage or even death via overdose. Addiction still has a part to play in the trouble with carfentanil, however. As reported by Vice, people who struggle with abuse of or addiction to heroin or other opioids obtained on the street may not be aware of these substances being laced with carfentanil. For this reason, addiction to heroin and other opioids can open up the risk that the individual can experience a carfentanil overdose. One of the biggest concerns about carfentanil, as described by Pharmacy Times, is the fact that it is strong enough to resist reversal through naloxone; one dose of the opioid antagonist, anti-overdose medication is not necessarily enough to reverse a carfentanil overdose. This is the biggest reason to get addiction treatment for anyone struggling with opioid abuse who has started using carfentanil. Addiction treatment is important for any individual who is using any opioid recreationally. 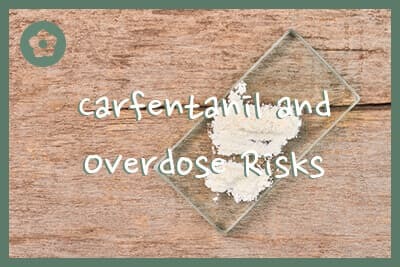 However, the extreme risk of overdose via carfentanil is the main reason that addiction treatment is needed right away for anyone getting high from this particular opioid drug. As mentioned above, carfentanil is an opioid 10,000 times as strong as morphine; this means that the effects of this drug can be based on the symptoms that occur with a weaker opioid, including fentanyl, but they would be amplified by the potency of the drug. This would have implications on both short-term and long-term effects of the drug, both physically and mentally. The following describes both the mental and physical effects of carfentanil use. All opioids work in the brain by inhibiting pain signals. This action also has an effect on the dopamine system, which participates in the body’s reward, pleasure, and memory sensations and processes. By stimulating this system, opioids like carfentanil can cause a person to experience an intense state of pleasure and wellbeing called euphoria. This is the main goal of individuals who use opioids for recreation. Nevertheless, abuse of opioids like carfentanil can sometimes create a condition called tolerance, where more of the drug is needed over time to create the same effect. This can lead to physical dependence and physical and mental addiction over time. However, with a substance as potent as carfentanil, it can also greatly increase the risk of overdose and the accompanying physical and mental injury, or even death. Again, because of the sheer strength of this drug, these effects can be quite pronounced, potentially leading to the person accumulating acute or chronic physical damage that can lead to disability or death. In particular, the immediate risk of abusing carfentanil is that the individual will stop breathing entirely, resulting in coma and potential death. Distinguishing abuse of carfentanil from other opioids may be nothing more than the difference between life and death for some. Nevertheless, being able to recognize opioid abuse in general can help to identify a problem that will or does include potential for carfentanil abuse. People who are abusing opioids generally demonstrate a variety of mental and physical symptoms and issues, which are described in the following sections. Inability to stop using the substance or to control how often, how much, etc. Noting the short-term and long-term physical and mental effects –as well as behaviors that might indicate addiction or continued abuse – can help an individual or loved ones determine that treatment is needed for a substance use disorder involving carfentanil. Through making sure that no element of the person’s addiction or substance abuse is left out, the treatment program increases the likelihood that the person will emerge from treatment able to maintain abstinence for the long-term. All of these external influences, and others, can make a person who would otherwise require an outpatient program to need to enter inpatient treatment, or vice versa. A reputable treatment program will take all of this into consideration when developing a treatment plan. When the right treatment program is selected, the individual is more likely to make it through detox and withdrawal, complete treatment with motivation and hope for recovery, and move forward after treatment into a future without substance abuse or addiction.